Each year, nearly 50 million people from all over the world travel to a singular destination in the Mojave Desert: a tiny, twinkling speck in the midst of seemingly endless nothingness. Unlike the beckoning harbors of New York or San Francisco, upon which great cities couldn’t help but flourish, Las Vegas rose forth from the barren Nevada soil by creating its own destiny—a determination to be different, and to put on a show that simply can’t be experienced anywhere else. If the crowds from InfoComm 2015 were any indication, 2016 in Vegas is set to be a show for the record books. Thus, it’s fitting that every other year, the city plays host to a show unique in its own right; a show that brings tens of thousands of people together to experience the newest and brightest iterations of the technology that make our lives a little flashier, a little easier, and a little better. That show, of course, is InfoComm. Held at the Las Vegas Convention Center from June 4-10, InfoComm, North America’s premier event for the professional audiovisual industry is poised to be bigger and better than ever before, with a fresh spate of experiences that can’t be had anywhere else. According to McGraw and Rachel Bradshaw, InfoComm’s director of education program development, this year’s show will work to build upon the success of last year’s with refinements designed to “surprise and delight” both attendees and exhibitors. From its keynote kickoff by Stephen Dubner of “Freakonomics” fame, to a renewed education program that gives attendees unprecedented access to the vast array of knowledge on hand, to a host of improvements aimed at the smaller things, such as additional lounge areas and shuttle bus service, the groundwork is certainly in place for one of the best and most memorable industry events in history. Other all-new programs for Super Tuesday cover the other big areas of the industry, such as the Digital Signage Summit, which will be presented in cooperation with Invidis Consulting and focus on digital signage opportunities in the retail sector; Technology Management in Higher Education, which will explore the challenges of meeting the expectations of today’s students at scale; and a revamped Future Trends seminar, which will give attendees an in-depth look at the bleeding-edge technology set to transform the industry. “We’re trying to kick it up a notch and take it even higher in terms of the experience value for the attendees and the exhibitors,” McGraw said. 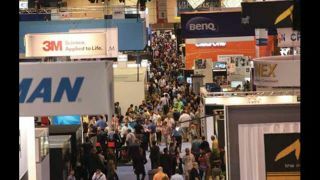 “And at the end of the day, it’s about seeing new products, attendees connecting with each other and with the manufacturers that are exhibiting, and the learning opportunities that come from the show.” In this regard, InfoComm International has done just about everything in its power to set the stage—the rest of the production is in the hands of the exhibiting companies, which have also been working fastidiously to come up with ways of leaving a lasting impression on attendees. For Crestron, it’s about providing technology for every space, according to Dan Jackson, the company’s R&D manager. “The biggest trends at this year’s show will be solutions for today’s changing workplace,” he said. The company will be exhibiting its various solutions for huddle rooms, presentation solutions, and equipment to make collaboration as seamless as possible. “With one-third of all professionals working remotely, organizations need technology solutions that enable knowledge workers to work in teams in real time, locally and remotely,” Jackson continued. Connectivity will be a big theme for loudspeaker manufacturers, like Renkus-Heinz, as network-based distribution continues to gain momentum around the industry. “It’s all about Dante connectivity,” said Margie Kirby, marketing manager at Renkus-Heinz. The company will be showcasing its newest Dante-capable product series, the Iconyx Gen5, as well as a new point-source system and software solution, with demonstrations at its booth and audio demo room. What will the show’s other big themes be? Ultimately, though, we’ll have to wait until the doors to the show floor open on the morning of June 8 to get the full picture. Here’s what several other major players in pro AV expect the trends and themes for this year’s show to be, and how they’ll be tailoring their presence there to meet or further these motifs. “We at Lectrosonics anticipate an even further dominance of Dante-related devices this year, and to that end, we’ll be showing our full complement of input, output, and ‘bridge’ Dante units, including the DNTBob88 Breakout box, the DNT16i input-only unit, and the DNT0212 two-input, 12-output unit. The SPNDNT unit allows bridging between Dante lines and our Aspen processing units. “In 2020 the AV community will look back and see the migration to AV over IP as the most pivotal technological shift of the decade. For years there have been video-over-IP products, but these can introduce latency and compression artifacts because of codecs, which can degrade image quality and create challenges for professional applications. At InfoComm 2016, DVIGear will demonstrate its game-changing DisplayNet AV-over-10GbE products. “It is always exciting to see the latest innovations on display at InfoComm. This year, I anticipate seeing monumental advancements in AV, with companies showcasing large-format touch displays, unique videoconferencing equipment, and products tailored for mobility. “With the improved performance of hardware video compression engines, AV over IP becomes a more viable solution for medium and large video matrix switching. As we move closer in merging AV with IT, moving video to a network environment becomes an inevitable path to the future. “Video walls and the delivery of AV over IP are the hottest trends in AV. The skillsets of IT people and AV people are creating a winning combination to serve customers who want the best of both worlds. “Vegas always inspires us to bring a bit extra, reach a bit further, and ‘more’ is the unofficial theme for DPI’s exhibit this year. Look for more of everything that attendees have come to expect from DPI. A reconfigured, conversation-oriented booth and a new way to interact with our displays are only a few of the many surprises we have in store for InfoComm 2016 attendees. “At this year’s InfoComm, we anticipate seeing fine-pitch LED for seamless video walls to continue to take center stage. We will be demonstrating the latest in ultra-fine pixel pitches with a massive 8K video wall featuring a 1.2-millimeter pixel pitch, as well as a technology demonstration of 0.9 millimeters—this is where direct-view LED becomes an excellent solution for close-viewing applications, such as conference rooms, auditoriums, control rooms, high-end retail, broadcast, and even high-end home. “Closed, proprietary systems are a thing of the past, and customers will come to InfoComm seeking less complexity in deployment, utilization, and control of their AV networks. AV over IP is now mainstream and can be deployed using open standards. However, the critical missing piece of the puzzle is a simple, easy-to-use management system. We provide the means for anyone to deploy video systems to deliver the most modern form of content without needing a Ph.D. in physics. We assemble the best technology, wrap it in a simple-to-use management platform, and make it easy for everyone. “Two trends that we are addressing in our offerings this year are the ability to integrate with soft-codec solutions and switch and extend video over LAN. Utilizing our UH2X-P1, we can extend HDMI over HDBaseT with USB for web cameras situated by the display back to the PC for videoconference applications. “More than anything, I am looking forward to seeing the practical uses of 4K, and I think it is poised to create a total revolution in meeting room design. The commercial segment of AV really differentiates itself from the consumer market with 4K by utilizing higher resolution in a totally different manner. “We expect a lot of discussions will focus on mobile video compatibility, enhanced content delivery methods to multiple devices, and of course, 4K. To address these trends, Exterity will demonstrate its latest IP video innovations that help businesses across a wide range of vertical markets strengthen their communication networks by making high-quality video content consistently and flexibly available from any source to any device. “Broadcasters are looking for video-over-IP solutions and the ability to transport UHDTV streams across IP networks. We’ve responded by adopting TICO compression technology from intoPix, designed to be the standard for moving live content efficiently over IP networks and to enhance live IP systems by increasing efficiency and reducing cost for HD and 4K/UHD video. ���Over the past several years, we’ve seen several new technologies emerge that, in a sense, have put both the broadcasting and AV markets into a temporary state of shock. Where once there was a single way to build a system, there now are multiple technologies to choose from. Matt Pruznick is associate editor of SCN and Residential Systems. Follow him on Twitter @pruznick.